For seniors, slipping and falling can be the cause of numerous injuries. Commonly, a slip and fall can be the cause of broken bones, head injuries, sprains/strains or painful bruising. Ideally, the best way to approach this issue is to try to prevent the falls in the fist place. Although anyone, at any age, can slip and fall, it becomes more common as we get older. 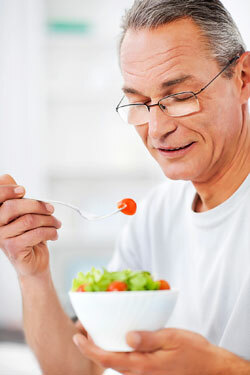 Balance issues, dizziness, and weakness of muscles are quite common in seniors and this provides the right mix to increase the chances of falling and and potentially injuring themselves. Often, the fall may cause injury, but it becomes the secondary issues due to the fall that rises up and becomes the major health problem. Due to increased chances of weakening bone structure in the senior population, a fracture can certainly occur upon falling. If the fracture causes reduced mobility, such as in a hip fracture, the individual can suffer from longer term effects such as chronic pain, reduced lung function and weakening of the musculature. 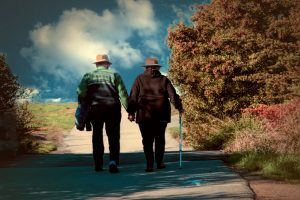 For these reasons, it is extremely important that steps are taken to try to limit the possibilities of falls. Whether you are a senior yourself or are the loved one of a senior, actions can be taken right now to help to prevent unnecessary falls. During the winter time, it is important to watch for ice buildup on steps and sidewalks. Gutters that drip can often be the cause of ice buildup and should be repaired. Sand or salt could also be applied. Someone should be dedicated to making certain that all sidewalks are clear from snow and ice. Properly installed handrails can make a considerable difference for those who have difficulty with balance. By securing handrails at the proper height in the proper areas, this can prevent falls. For those that have difficulty walking, it is often necessary to use a cane or a walker. These can be used for stabilizing the person while they are moving. Some are resistant to using a walking aid, but it may be time to have a discussion if that is the case. Installing bathroom aids like grab bars in the shower area can be a great benefit. These wet surfaces can be the perfect place for a slip and fall and any aid that can help to assist the person with standing or walking is a good thing. Keep the floors clean of any objects that may cause a fall. Straighten rugs and remove any objects that may get in the way and cause a loss of balance and a fall. It is important to stay safe and prevent slips and falls at any age. But, it is even more important to take steps to prevent those that are especially at risk for falling. Improve your posture and you could improve your mood. Studies show sitting up with your spine straight and shoulders back can make you feel happier and more confident. Psychologists say this simple physical change lowers stress hormones and increases happiness hormones, which can cue the brain to switch to a more positive and poised state of mind. Life is ironic. A brilliant man, who dedicated his life to improving the health of humans, was claimed by Alzheimers in the prime of his career. Larry Whitesell grew up in Pennsylvania and attended Delaware College with a degree in animal husbandry. He married, Donna Keckler. Together, these opposites completed each other in a very complementary way. They had two daughters and now have two beautiful granddaughters. In 1983, Larry uprooted his family and moved from Hershey Pennsylvania where he dedicated 15 years of his life doing cardiology research at the Hershey Medical Center in Pennsylvania. As a leader in his field, he was noticed by the University of Wisconsin’s head of cardiology and was offered a ground breaking position at UW Wisconsin where he started a program in Cardiology Research. As Larry was blazing a trail utilizing gene therapy in cardiac research, he noticed some memory issues. In 2010, he retired early and was diagnosed with the early onset of Alzheimer’s. 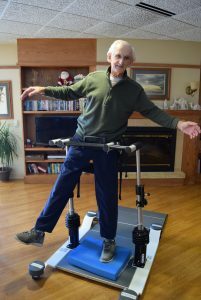 When Larry reached the stage where his family was unable to care for him, he came to Maplewood of Sauk Prairie to receive skilled care and physical therapy. Maplewood has adopted the “Music in Memory” program where people with dementia and Alzheimer’s listen to favorite songs from the early adult years. 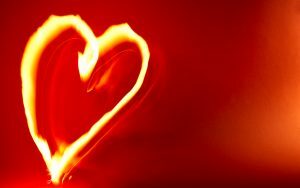 This program has been known to provide joy and bring a person back to themselves while the music is being played. Those listening to music have experienced calming behaviors and may have the ability to respond in the present for a while after a listening session. Larry is one of the success stories associated with “Music in Memory”. As a result, he is experiencing more connections to his surrounding, making more eye and verbal contact. Larry made a difference in many people’s life by doing cutting edge research. He has plans to continue contributing to society after he passes. He will be donating his brain for research in the hopes that scientists can pinpoint the gene that causes Alzheimer’s and a cure will be found. Maplewood Health & Rehab Center of Sauk Prairie Encourages Safe Steering Wheel Hand Placement. Maplewood partners with AARP and hosts 4 driving classes a year to help seniors lower their insurance and retain or become better drivers. There is no way your license will be revoked by taking these classes. Rather, the goal is to keep you driving longer. September 11th from 8:00-noon, “CarFit” is offered. This event has you bring your car to Maplewood and adjustments are made to individualize the fit of your car to your body. It essentially makes it easier and more comfortable for you to see and drive. November 11th from 8:00 – noon, a classroom instruction called Driver’s Safety is offered. It reviews driving changes such as steering wheel hand placement of “9 and 3” vs. “8 and 2” – which is what was taught prior to the late 80’s. Progressive Insurance had a very helpful article about position grip on the steering wheel. On September 3, Drive Safe Today Day will help us all break out of some of our bad driving habits. Together, we (Progressive and you … if you’re up to it) will pledge to drive a little safer. We’ll offer up some tips—easy things you can do to break out of some of the less-than-ideal driving habits that (let’s face it) we all have. And, we’ll work together to make driving a little safer … at least for a day. Some of those habits will be obvious (like, put down the phone); others, less so.